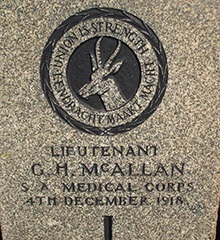 George Herbert McAllan was the son of Alexander and Marion McAllan. George was born in Belfast on 2nd February 1879. George attended the Collegiate School, Monaghan and then the Royal School Dungannon. 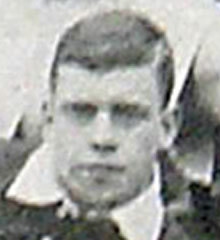 George McAllan played rugby for both schools and then for Dungannon. In February 1901 he moved to South Africa. In 1903 he married a Catherine Hogate of South Africa. During the Great War he volunteered for active service and in February 1915 he was gazetted 2nd Lieutenant with the Royal Flying Corps, and was later promoted to Lieutenant. He died in December 1918 from the effects of injuries received whilst in the Royal Air Force. Travel through Thaba Tshwane and out past the old 1 Military Hospital in the direction of Krugersdorp. The entrance to the old military cemeteries is on the right just past the turn off to Valhalla. The cemetery is just to the left of the road leading from the entrance.